Just before I get into the subject at hand, I want to let you know that my blog is being critiqued today by Laura of Laura B. Writer. (Thanks, Laura!) Pop over there and see what she has to say about By Word of Beth, leave a comment if there’s something you’d like to praise or pan, then come back to read some of my thoughts on the relation between writing and directing. This week, as Behind the Scenes Month continues, we’re looking at directing — for stage and screen. I thought of titling this post “Why is a writer like a director?” but that sounded too much like Lewis Carroll’s “Why is a raven like a writing desk?” and I didn’t want you to consider my question the same sort of unanswerable conundrum. In fact, there are many similarities between directors and writers. (Not including the fact that some screenwriters and playwrights direct their own work.) I’ll share just a couple that come immediately to my mind. Directors work with character, setting, dialogue, to tell a story — story is the end purpose of film and play. Directors must be imaginative and creative in finding the right way to tell the story, and must be prepared to edit or excise scenes which do not adequately contribute to the story. 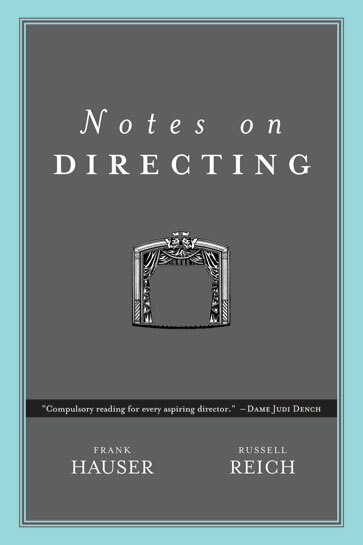 The book Notes on Directing by Frank Hauser and Russell Reich may have been intended for directors, but I have found some invaluable advice for my writing journey within its pages. This small book is a compilation of notes from British director Frank Hauser, gleanings of the wisdom he imparted over the years to — as the jacketflap blurb puts it — “a host of theatrical and cinematic figures, including Sir Alec Guinness, Richard Burton, Sir Ian McKellen, Dame Judi Dench, Kevin Spacey, and many others who called Hauser their director, mentor, teacher, or boss.” The notes were put into book form by Hauser’s apprentice, Russell Reich. Within the covers of this 127-page volume, there is gold. I am going to cite just a few examples, and tell you how I relate them to my own writing. The quotes are in bold font. Unless otherwise indicated, the thoughts that follow are my own. Your take on these notes may be different, you may agree with me on some and not others — I invite other writers to read the book, and find the places where it speaks to you, where the director’s journey and the writer’s journey intersect in your experience. From the section Understanding the Script, #8: “Identify the story’s compelling question.” ~~ This is key for the director looking at a play script or screenplay and preparing to bring that script to life. As I have learned from other writers, this is essential to writing a good story in the first place, whether that story be picture book, novel, or indeed, a play. From Section III, Casting, #29: “Directing is mostly casting.” ~~ Or, as Blake Edwards used to put it, “Your characters make your story.” When one is writing, one must pay great attention to one’s casting, to the choice and fleshing out of the characters in the story. From Section IX, Elements of Staging, #108: “Give your actors face time.” ~~ In the book, Hauser is adjuring his students to beware of upstaging the actors with “things”, props, furniture, costume details. My take on relating this to writing is that writers need to make sure their characters are not upstaged, and their story is not derailed, by things such as florid description, unnecessary tangents, imprecise language. And finally, going back to Section II, The Director’s Role, #27: “It is not about you.” ~~ In the end, our writing is about sharing a story. It is about bringing a message to the audience, to the reader. It is not an ego-trip. I hope these brief quotes have given you some insight into the director’s role, as well as into how a writer can learn from what a director does. Interview on Imagine! Create! Write! Thanks, Susanna. And thanks for taking the time to read and comment on Laura’s critique. Now to see what I can do with all the suggestions she made! Wow, I found Laura’s input very insightful, Beth. Very encouraging over all, but she spotted things that wouldn’t have noticed. She is such a gem! I was very happy to see these concrete links between directing and writing. I know you have hinted at this in the past, but your examples are very concrete and helpful. Thank you. Laura spotted things that I hadn’t noticed as well, (obviously). Unfortunately, some are beyond my power to change, but I’ll do what I can! Thanks for your comments on my post today. I’m glad you found my thoughts helpful. Left a message on Laura’s blog. Understand her comment on color, but not the “garbage.” Your blog has such a crisp look to it and is easy to read. Wouldn’t dare submit mine — I’m lucky I have one up and running. Very interesting Post today Beth. Enjoyed reading about the connection between writing and directing. It really has so many applications for all of us. Another winner. Thanks! Thanks, Pat. I’m doing a little tidying (it’s easier to tidy on the blog than in the apartment! 😉 ) Thanks so much for taking the time to comment on Laura’s critique — I’ll check out your comment right now! I’m glad you found the writing and directing comparison a helpful one. I find that book has such a wealth of information. Some of it isn’t applicable to writers, of course, but much of it is. I have bookmarked this post. I think it is really going to help with one of my works in progress. Thank you. Also, thanks for linking to the blog redesign post. I enjoyed reading the suggestions. It made me think about a few things on my blog. The blog critique post was interesting, wasn’t it? I’ve gained a lot from following her blog the last few months. I’ve never hear of a blog critique – I’m going to check it out 🙂 I really don’t know a lot about all the different people in movies/plays. What’s the difference between the director and producer? (sorry if it is a dumb question). There’s no such thing as a dumb question, Erik. If you don’t know something, then it’s a good question. A producer is the person who gets the money together for a movie to be made, and makes sure all the financial things are in order (among other things). The director is involved in the day to day filming of the movie, casting the actors, saying how he/she wants the scenes to be played, choosing the camera angles, and things like that. A book I have called “Movie Speak” says the most asked question is exactly the one you’ve asked, and the easiest way to explain is that it’s sort of like a football coach and a quarterback. The coach is on the sidelines, but is involved in the overall plan. The quarterback is right in the action, calling the plays. I”m going to look for a plug-in to see if the nav bar is something I have to add on. I don’t know if I’ll keep the banner (which was underneath the other one all along!) It makes the blog title very difficult to read. Quandaries and decisions… … … Did you get my email? I sent it to the viola e.
I think I know what you need to do to get it to behave. If it’s what I’m thinking, you’re going to be digging into the HTML/CSS for your theme. Or maybe I can have a look at it and email you. Ok, I looked at the code and it’s what I thought. To emailz! Thanks, Steph! You’re a gem! P.S. I’ll check it out over the weekend. Thanks, Laura! And thanks for your critique — it’s tricky to try to put into practice the things you suggested, but I’ll continue to work on it. The colors of the sidebar etc are out of my control.